What one food would you request if you were on a desert island? Many people we know would answer that question with a resounding, “Pizza!” (Hands are raised over here.) Luckily we’re not stranded on that island, but because pizza is classically a no-no on most diets, we would probably eat it more often if we were. Nancy Fox and Skinny Kitchen have remedied that problem with her yummy remake of the recipe using low-fat ingredients and tortillas. You can now indulge…right at home! Thin pizza crusts are so popular these days. So what better thing to use for ease and to make it healthier than a whole grain flour or whole wheat tortilla for the crust! This New pizza makes such an easy weeknight dinner the whole family will love. Serve with a salad and you’re all set.Each yummy pizza has 330 calories, 7 grams of fat and 8 Weight Watchers POINTSPLUS. Each pizza even has 6 grams of fiber! 1. Place tortillas under broiler for about 1-2 minutes to toast, turn over and broil 1 more minute to toast other sides. Keep an eye on them so they don’t burn. Remove from oven and set aside. 2. Place sliced onions on a microwave safe plate and cook in microwave for 2 minutes to soften. 3. Add chicken to a small bowl. Toss with 3 tablespoons barbecue sauce and balsamic vinegar. 4. To Assemble Pizza: Spread each tortilla with ½ tablespoon barbecue sauce. Use the back of a spoon to spread. Top each with ½ of chicken/barbecue sauce mixture and spread around. Place ½ of the onions all over the top of each pizza. Sprinkle each with ¼ cup tomatoes. Finally, top each with 3 tablespoons light mozzarella cheese and ½ tablespoon Parmesan cheese. 5. Place on a baking sheet and broil for about 1-2 minutes until cheese is melted and tortilla is browned. Keep an eye on them so they don’t burn. 6. Remove from oven. Place each on a dinner plate. Pull apart with your hands into pieces to eat or serve with a fork and sharp knife, if desired. I used Trader Joe’s whole grain flour tortillas. They are terrific. Each has 120 calories, 2.5 grams of fat and 4 grams of fiber. Most supermarkets sell whole grain flour or whole wheat flour tortillas. I also used the lite mozzarella cheese at Trader Joe’s. Sometimes I like to top this pizza with a garden salad tossed in my skinny ranch dressing. It taste really yummy this way. The barbecue sauce on the pizza and the ranch dressing on the salad make a winning combination! Previous ArticleGoing Off the Deep End as Swimsuit Season Approaches? 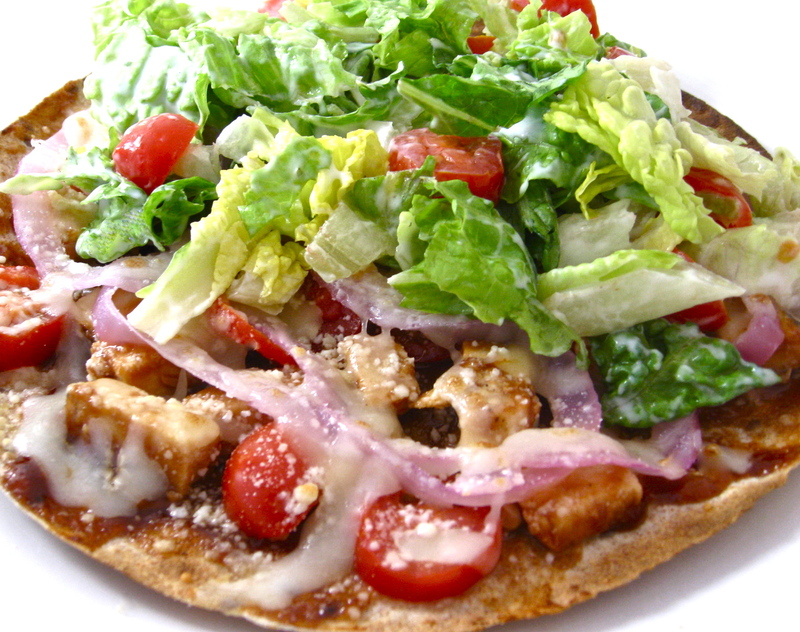 Thank you so much Better After 50 for featuring my Skinny BBQ Tortilla Pizza. I hope everyone enjoys it!